Super Sized Luxury Estate Purple Martin Birdhouse! This copper roof purple martin birdhouse is the ultimate statement to the birds. 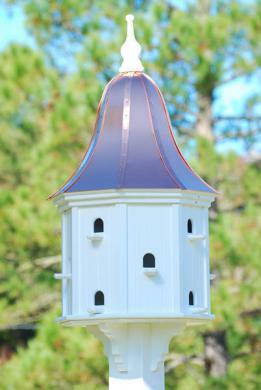 This is an extra large Copper Roof Birdhouse and is constructed of PVC White Vinyl to last for many years. 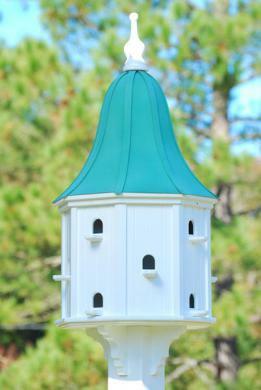 This estate sized Purple Martin Birdhouse features twelve spacious compartments with perches. extra entrances have been added for a balanced architectual look. Precision engineered and meticulously designed to impress the most particular bird enthusiast. The roof lifts up for easy cleaning. The birdhouse is approximately 5 feet with a lift up top for cleaning easily. Will not crack, split rot or fade. This copper roof birdhouse is a distinctive addition to any backyard or garden and will be the central focus of your backyard or garden. Complete with vinyl sleeve and attached decorative brackets - fits on your 6 x 6 post. NOTE:Post NOT included but the sleeve to mount the 6X6 post IS included. The sleeve is a 6 inch sleeve that mounts on a 6 X 6 post. OPTIONAL Vinyl square 6X6X108 vinyl post cover available upon request for $230.00. Post can be purchased at most home improvement stores.